Isolation of the right subclavian artery (RSCA) is a rare anomaly in which the RSCA arises from the pulmonary artery via a ductus arteriosus, usually with a right aortic arch and lesions associated with a right arch, such as tetralogy of Fallot. The presence of an isolated RSCA arising from the pulmonary artery in association with d-transposition of the great arteries (d-TGA) is extremely unusual, with few cases previously reported in the literature. ,,, We illustrate a case in which the clinical presentation was diagnostic, and discuss the imaging modalities used to confirm the diagnosis, the embryological basis of the finding, and implications for surgical repair. The patient was a full-term, 3.7 kg male newborn with a fetal echocardiogram performed at 22 weeks gestational age revealing d-TGA with an intact ventricular septum. He was born via repeat cesarean section with Apgars 8 and 8 at 1 and 5 min, respectively. After transfer to the intensive care unit, initial pulse oximetry demonstrated a right arm saturation of 99%; while right ear, left arm, and right leg saturations ranged from 50 to 60%. Arterial blood gas sampling revealed a partial pressure of oxygen (paO 2 ) of 148 mmHg from a right radial arterial puncture and paO 2 of 24 mmHg from the indwelling umbilical arterial catheter. The right arm and shoulder demonstrated a well-demarcated pink appearance; his face, left arm, and rest of the body remained deeply cyanotic. An initial transthoracic echocardiogram was performed (Phillips iE33, Phillips Medical Systems, Bothell, WA, USA) and confirmed the diagnosis of d-TGA with a restrictive atrial communication. Balloon atrial septostomy was performed with ultrasound guidance at the bedside. The atrial septum was subsequently seen to be widely patent and the right ear, left arm, and right leg oxygen saturations increased to 85%. The right arm remained 99 to 100% saturated, a finding diagnostic of a RSCA arising from the pulmonary artery in d-TGA. Further detailed echocardiographic imaging revealed a left-sided aortic arch with the first head and neck vessel from the aorta coursing rightward and superiorly without bifurcation. A vessel with pulsatile flow by spectral Doppler appeared to arise from the proximal right pulmonary artery and course rightward, suggesting an isolated RSCA arising from the pulmonary artery [Figure 1] and [Video 1]. 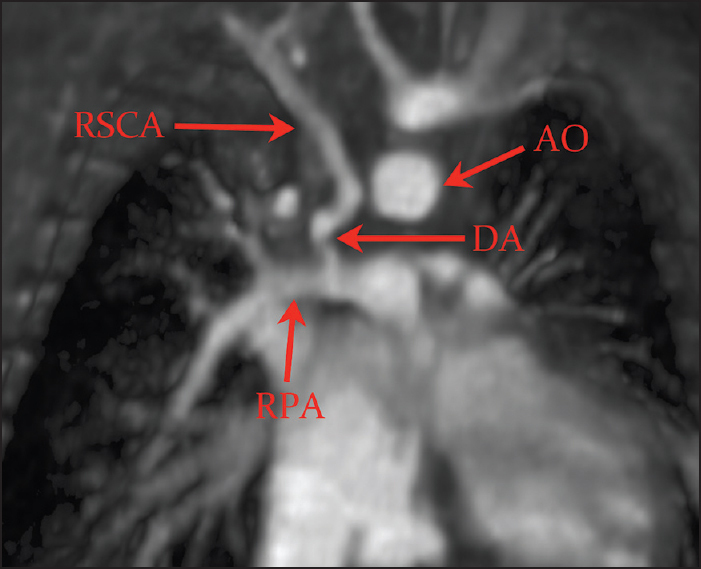 Contrast-enhanced magnetic resonance imaging (MRI) with thin-slab three-dimensional surface rendering was performed the following day, confirming the origin of the RSCA from a ductus arteriosus arising from the proximal right pulmonary artery [Figure 2]. The patient subsequently underwent arterial switch operation at 5 days of life. Intraoperatively, the RSCA was found to arise from the right pulmonary artery via a long segment of ductal tissue [Figure 3]. The right ductus arteriosus was ligated, the ductal tissue from the RSCA was trimmed, and the artery was anastomosed to the right common carotid artery. The postoperative course was complicated by an atrial reentrant tachycardia controlled by beta-blockade, with otherwise stable hemodynamics and normal perfusion and mobility of the right arm. Postoperative echocardiogram revealed no gradient from the right common carotid artery to the RSCA. Simultaneous four-limb blood pressures demonstrated no differential between the right arm, left arm, and legs. In a patient with normally related great arteries and this unusual aortic arch abnormality, when the right ductus arteriosus closes, the isolated RSCA is typically supplied by retrograde flow from the vertebral artery via the circle of Willis, and may lead to subclavian steal syndrome with subsequent neurological deficits and syncope. Hence, at the time of arterial switch operation, our decision was to reimplant the RSCA to the ipsilateral carotid artery rather than simply ligate the right ductus arteriosus. The diagnosis of an isolated RSCA can be made by clinical presentation alone in a patient with d-TGA. 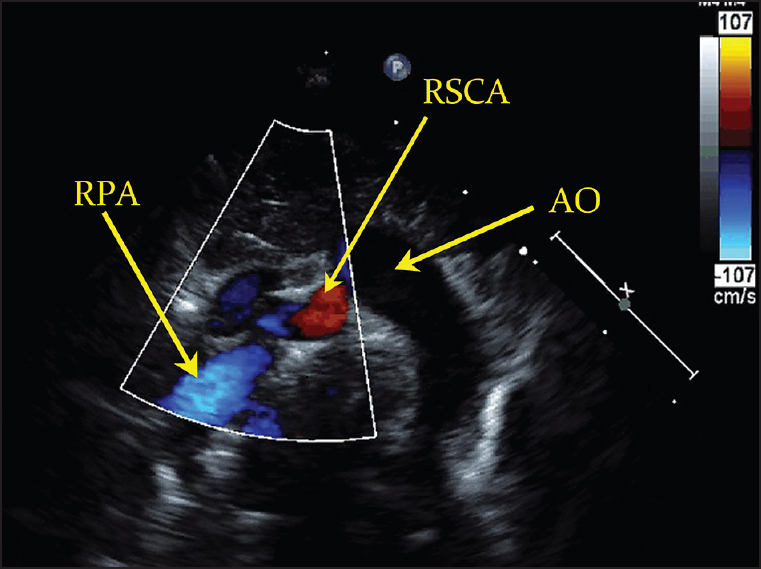 Noninvasive imaging modalities such as transthoracic echocardiography and MRI can confirm the origin of the RSCA. 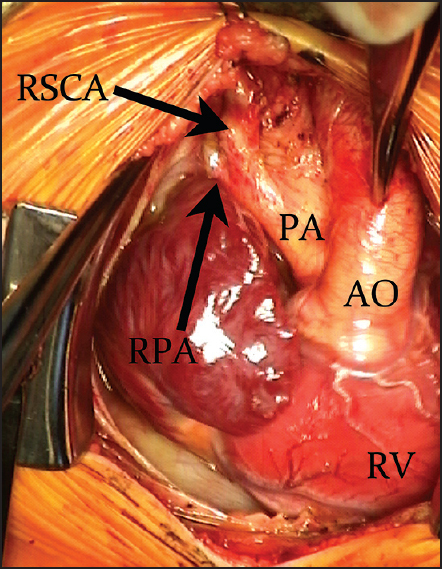 Surgical reimplantation of the anomalous RSCA with appropriate excision of residual ductal tissue can be performed at the time of the arterial switch operation to prevent subclavian steal phenomenon. McElhinney DB, Silverman NH, Brook MM, Reddy VM, Hanley FL. Rare forms of isolation of the subclavian artery: Echocardiographic diagnosis and surgical considerations. Cardiol Young 1998;8:344-51. Mosieri J, Chintala K, Delius RE, Walters HL 3rd, Hakimi M. Abnormal origin of the right subclavian artery from the right pulmonary artery in a patient with D-transposition of the great vessels and left juxtaposition of the right atrial appendage: An unusual anatomical variant. J Card Surg 2004;19:41-4. Hofbeck M, Rupprecht T, Reif R, Singer H. Faulty origin of the right subclavian artery from the pulmonary artery: A rare cause of subclavian steal syndrome in childhood. Monatsschr Kinderheilkd 1991;139:363-5. Paquet M, Williams RL. Origin of the right subclavian artery from the right pulmonary artery in a newborn with complete transposition of the great arteries. Can J Cardiol 1994;10:932-4. Marin C, Sanchez ML, Fernandez-Velilla M, Ruiz Y, Maroto E, Delgado J. MR imaging of isolated right subclavian artery. Pediatr Radiol 2008;38:216-9. Hernandez LE, Shepard CW, Bamforth SD, Anderson RH. The right subclavian artery arising as the first branch of a left-sided aortic arch. World J Pediatr Congenit Heart Surg 2014;5:456-9. Anderson RH, Chaudhry B, Mohun TJ, Bamforth SD, Hoyland D, Phillips HM, et al. 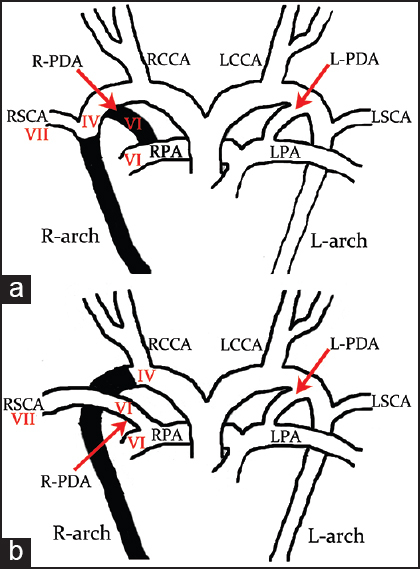 Normal and abnormal development of the intrapericardial arterial trunks in humans and mice. Cardiovasc Res 2012;95:108-15. Gupta SK, Bamforth SD, Anderson RH. How frequent is the fifth arch artery? Cardiol Young 2014;29:1-19. Gowda SLG, Bhat PS, Jayaranganath M, Hedge M. Isolated left brachiocephalic trunk arising from the main pulmonary artery with right aortic arch. J Thorac Cardiovasc Surg 2014;147:822-3. Miller SG, Campbell MJ, Barker PC, Hill KD. Isolated right subclavian artery arising from the right pulmonary artery via a right-sided ductus arteriosus with associated pulmonary steal phenomenon. Cardiol Young 2012;22:216-8.